(green). Check out Mark's How To Cook Everything iPhone and iPad apps, which may change the way you cook forever. Mark Bittman's highly acclaimed, bestselling book How to Cook Everything is an indispensable guide for any modern cook. With How to Cook Everything The Basics, he reveals how truly easy it is to learn fundamental techniques and recipes. 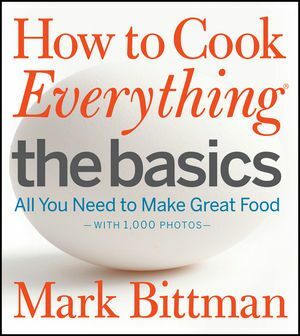 From dicing vegetables and roasting meat, to cooking building-block meals that include salads, soups, poultry, meats, fish, sides, and desserts, Bittman explains what every home cook, particularly novices, should know. One thousand beautiful and instructive photographs throughout the book reveal key preparation details that make every dish inviting and accessible. With clear and straightforward directions, Bittman's practical tips and variation ideas, and visual cues that accompany each of the 185 recipes, cooking with How to Cook Everything The Basics is like having Bittman in the kitchen with you.